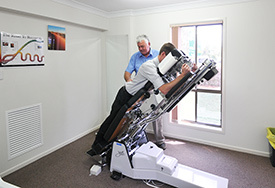 Doctors Pickford, Thatcher, Hunter and Matthews utilise a variety of safe effective adjusting techniques including Thompson drop piece, Diversified and Gonstead whole body adjustments. Other techniques routinely used are Activator and SOT but we are predominately a manual adjusting office. We also specialise in extremity (shoulder, elbow, hand, hip, knee and feet) correction.